Do you own a food processor? If so, Strawberry Frozen Yogurt might just become your new favorite summer recipe! It’s so easy, light, and delicious, you’ll wonder why you never made it before! Place all ingredients into the bowl of a food processor with blade attachment and lid in place. Pulse ingredients several times in quick bursts until strawberries begin to break down (remove lid to break clumps apart with a utensil if necessary). At this point, you may flip the food processor switch to “on” for constant mixing. Allow ingredients to mix until well-combined. Pour yogurt into a freezer-safe container; place in freezer overnight. To serve, transfer to refrigerator for a few hours before serving (to soften). 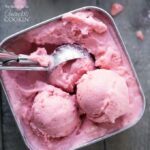 This recipe for Strawberry Frozen Yogurt was printed from AmandasCookin.com - https://amandascookin.com/strawberry-frozen-yogurt/ and can only be printed for education or personal use.